While women and their interest and needs are Aviva’s focus, some women will bring their male companions and some non-Black women have also joined the adventures. Just as men plan time to be with the “boys” on game and fishing trips, more women are planning to spend time with the “girls,” on adventure trips. Most leading tour companies now include a women’s division to meet the demand. Other companies, such as Aviva Travel Group, started as travel organizers for women and continue to do so. The combination of her love for books and travel was such a winning match that, “from then on these literary tours became a regular part of our clubs itinerary,” added Bridges, who spent 35 years as a librarian before retiring in 2016. While literary settings are not always her agency’s destination, books play a significant part in their explorations. 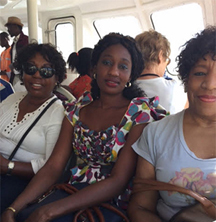 Some trips are bound to where sister book clubs exists, such as Charlestown, SC, or where authors for whom they want to meet reside, such as a cruise to Trinidad, where they had lunch with author Roslyn Carrrington. “Women who travel with me are book club women, avid readers, and they enjoy meeting each other,” explained the New York native, from her Phoenix base. When her groups travel, they often include museum, bookstores, and libraries on their stop list. Bridges has ten trips in the planning including to the National Black Theater Festival in North Carolina. Other trips to Panama, Africa, Phoenix, Portugal, a Mediterranean cruise, Dubai, Cuba, Japan, and a Scandinavian cruise are also in the works. “We enjoy cultural experiences wherever we can find them,” she continued. While women and their interest and needs are Aviva’s focus, some women will bring their male companions and some non-Black women have also joined the adventures. “If they are comfortable with the group, then I am comfortable,” said Bridges. Aviva tour leaders are some of her most valued clients who have traveled with Aviva several times and are active in the women’s travel group community. Having the “right” tour guide makes a difference, something I learned while touring Egypt with the late Doctor Ben. He would consistently point out things that other guides failed to mention. “Having tour leaders who are part of the family and there out of passion proves far more personable and intimate for the Aviva travel group community,” says Bridges.